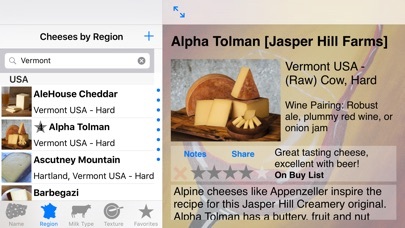 Need a cheese app for your iPhone or iPad? Fromage provides a convenient pocket resource of fantastic cheeses made throughout the world for your culinary exploration. The cheese library contains well beyond 1,100 world cheeses thanks to suggestions from our established base of Fromage users worldwide. Each cheese entry features artistically presented cheese photos, historically narrated flavor descriptions, and suggested best choices for complementary wines. 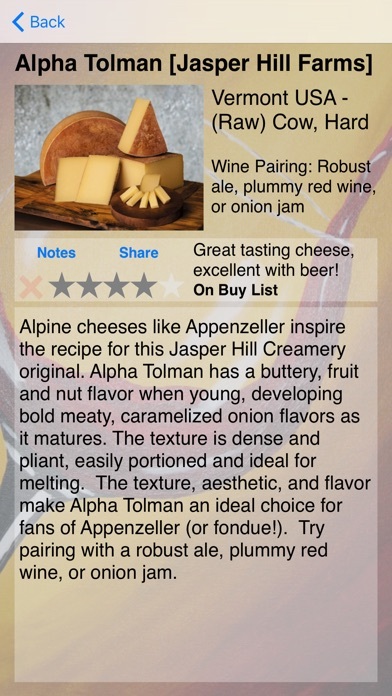 You can add your own favorite cheeses to the standard library and attach personal notes about any of the cheeses. Fromage uses iCloud to synchronize your cheese entries and notes between all of your Apple devices. If you’re a classically trained chef, professional party planner, cheese buyer, or just plain cheese lover, grab Fromage, your favorite wine, and experience the wonderful and historic flavors of cheese. _________________________________ Fromage comes with the ability to create personal cheese notes, rate cheeses from 1 to 5 stars (included an “Avoid” rating), add cheeses to your favorite lists (Try, Buy, or Favorites categories), record tasting impressions with up to 70 tasting keywords, and search the cheese library. You can also enter your own cheeses (including photos captured from your device camera) and list those cheeses automatically in the “My Additions” category. There is also a “Share” feature so cheese information can be sent (via e-mail) to friends or to the developer for inclusion in future versions of Fromage. _________________________________ Internet or Wi-Fi connection is not required for program use, which is great for remote locations when no data plan is available. Cheese library with permission from: •	igourmet.com •	CheeseSupply.com •	Spanish Institute for Foreign Trade (ICEX) The application supports English, French, Spanish, and German languages when the iOS device settings are set to that language. Note: The developer of Fromage reserves the right to remove or alter submitted cheese information that is copyright protected. I’ve used this application for many years now and I am still surprised about the amount of work the author put in. Congrats! I buy lots of different cheeses and have used this guide to search for new ones. Often I have to bring them in from the country of origin. I’ve shown this app too many cheesemongers I meet and all of them said they wanted this app. Hopefully they also bought it. Thank you Mr. Welch! Haven’t used it in a while, but now found that it locks up immediately. Disappointed since I need to log a particularly bad cheese. :-). (Installed on 6s.). I downloaded this app when I started working at an upscale French Bistrot in the city. It taught me a lot and reinforced a lot of the things I was learning about glorious cheese! I still use this app often and am grateful it’s still available. Don’t hesitate to get this app! And to its creators... 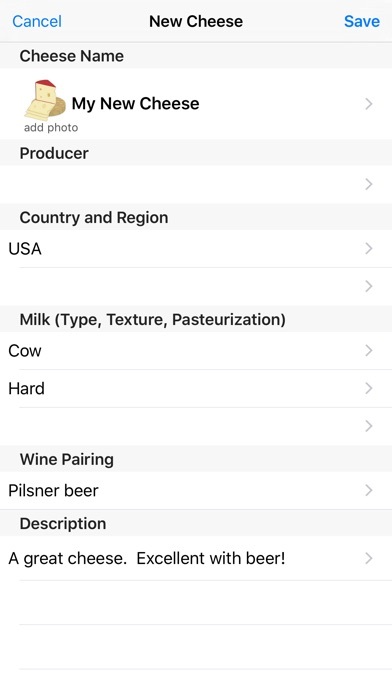 Thank you for taking the time to put this lovely app/cheese encyclopedia together. :). I enjoy finding new cheese on this app and saving cheeses I’m searching out in my favorite list. 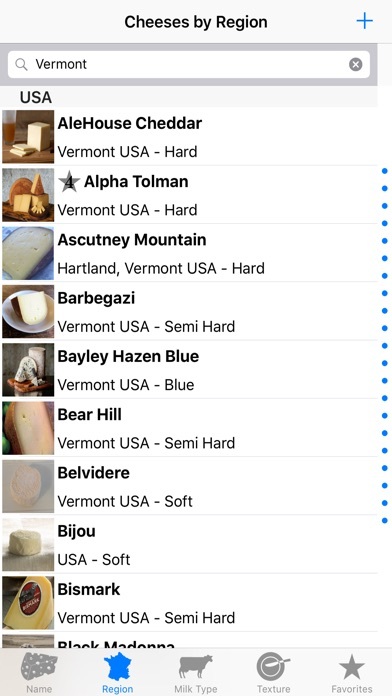 It would really make this app a lot better if there was a creamery name directory and it was searchable by cheese name. I just added creamery info for ten or so if my fave cheeses which was tedious. First I’d like the saved/favorites to sync across devices. I have both iPad and iPhone, but the data is not shared between them, so I have to re-enter the data twice or limit where I manage the information. Next, I’d like to be able to create a profile with my likes/dislikes. Third, I’d like to share share my information and opinions, and collaborate and see what others think and what their opinions are. 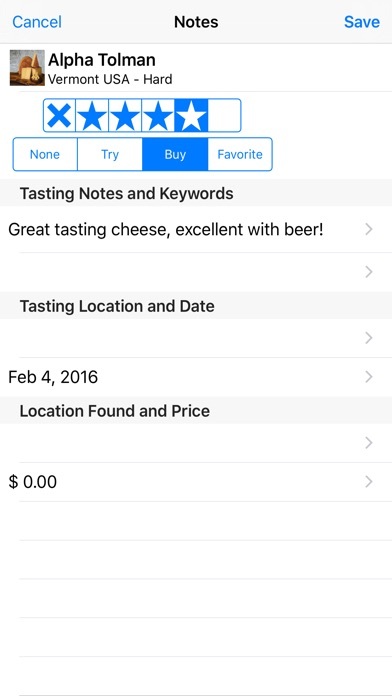 If you love cheese, and enjoy writing about it, then this app is for you. Thoughtfully put together and a great range of cheese entries. I think it's the best cheese reference app out there. I paid for the app but it won't open. I have an iPhone 6s and have updated all my software to 9.3. Does anyone know what the problem is?